Last month Health Canada approved a new physiotherapy treatment for some neurological disorders, in particular brain injury. Brian injury can impact a person’s ability to balance themselves and walk steadily. As a result of brain injury patients may be left with disrupted neural pathways which in turn impacts their ability to direct body movement control or sensory perception. 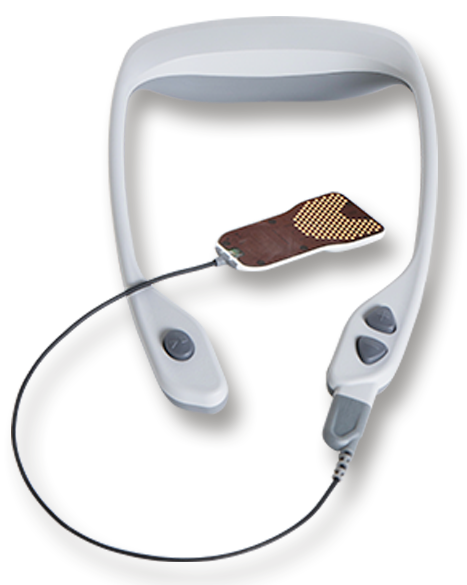 The PoNS (Portable Neuromodulation Stimulator) or Tongue Tickler is a portable device that fits into a patient’s mouth. It is a non-invasive wearable medical device used in conjunction with physical therapy in patients with mild to moderate TBI and Multiple Sclerosis and Cerebral Palsy. The device has almost 150 electrodes that stimulate the tongue. It feels like pop bubbles on the tongue when active. The impulses travel from the tongue to the brain and stimulate neuroplasticity. The device works on the theory that we can intentionally change and regulate the electrochemical environment in the brain by providing electric pulses. In the research setting, the PoNS device delivers specially-patterned electrical stimulation developed to mirror nerve impulses to the brain through 143-gold-plated electrodes on the mouthpiece which is placed on the tongue. For 20 minutes the electrical stimulation is coupled with targeted functional therapy, called Cranial Nerve Non-Invasive Neuromodulation (CN-NINM). Therapy consists of condition-specific physical, occupational, relaxation and cognitive exercises, based on the patient's deficits. Clinical research shows that electrical stimulation of the tongue activates two major cranial nerves – the lingual nerve (part of the trigeminal nerve) and the chorda tympani (part of the facial nerve). Electrical stimulation of the cranial nerves creates a flow of neural impulses that are then delivered directly into the brain stem and cerebellum – the main control centers for many life functions including sensory perception and movement. From the brain stem, these impulses travel throughout the brain and activate or reactivate neurons and structures involved in human function – the cortex, spinal cord and potentially the entire central nervous system. How does this happen? Researchers believe that sustained stimulation initiates a sequential cascade of changes in the actual interconnected nuclei, or neuronal network, the fundamental connections between the anatomical components of the brain. Multiple studies have found that when used daily at physiotherapy 75% of patients responded positively with improvements to their gait and balance. It is shown to improve and sustain rehabilitation to address brain dysfunction from TBI, degenerative, developmental and chemical brain disorders. Currently there is no drug therapy or biologic treatment that improves the outcome of TBI patients. This therapy remains investigational and is currently not insured. You can read about the company and the device and research here.